Panaji : The forest department of Goa has confirmed the sighting of a fully grown crocodile at Morjim beach whose images have gone viral on social media. The beach, 30 km from Panaji, is one of the most popular beaches in the state, especially with Russians and is colloquially referred as “Little Russia” also. 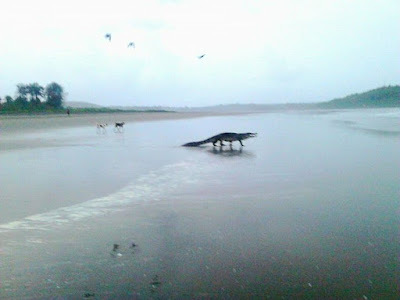 A set of four photos uploaded on Facebook by Nilesh Bagkar, a Morjim resident, showed the crocodile crawling along the beach, heading into the sea, with a few dogs in the background. “It is not from the sea. It must have come from the Chapora river, which flows into the sea at Morjim. It must have been chased by the dogs and that is why it ended there,” Deputy conservator of forests D N F Carvalho said. Crocodiles are commonly found in the hinterland in marshy rivers but there have rarely been instances of the aquatic reptiles sighted on the state’s beaches, which are visited by at least three million tourists annually.